Let's face it, many of the winners' speeches are dead boring. As with many things, we decided to make them interesting by turning them into a game! And because I'm a software geek, I wrote a program (actually, a series of Perl and shell scripts) to create the game. 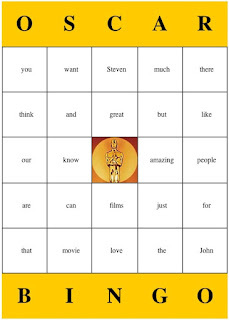 Print your own Oscar Acceptance Speech BINGO card (reload the page for a new card)! I used to actually print these out and put them up on the wall, but at some point I realized it was easier to run a repeating slide show on one of the many computers sitting around our house. The effort is here is mostly research, plus a little layout work in Powerpoint. The hard part isn't finding trivia; it's finding interesting trivia on each of the Best Picture nominees. I usually don't research much beyond that, because it becomes increasingly difficult to dig up fun facts about films nobody has ever heard of (sorry, Best Documentary Short nominees). Some years, if I have time, I'll work up every movie that's nominated for at least two awards. 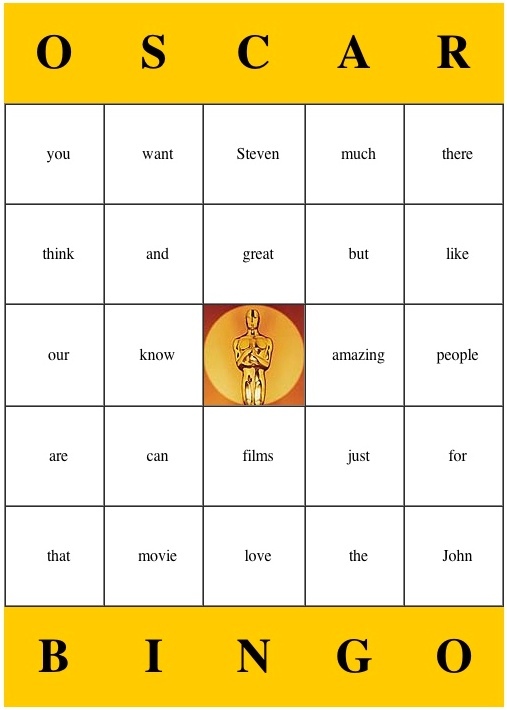 View 2013 Oscar Trivia images online (for slideshow, set delay to 20 seconds)! This one's the easiest of the lot; usually I just select one of the many PDFs available from various web sites. Players must fill out their ballots before the first award of the evening is presented; if anybody arrives late, they're handicapped because they can't guess any of the already-announced winners. The problem is, I don't like the formatting on many of these ballots, and my laziness is such that I prefer to scour the Internet for existing docs rather than create my own. My big concern is printing. The official ABC ballot looks fine, but wastes a lot of ink top and bottom. Moviefone's ballot is cleaner, but the over-branding all over the page bugs me. And graphic designer Jessica Jones' 2013 Oscar Ballot has a nice, old-timey look, but again, there's a lot of black in that huge logo. In the end, I decided to go with the Yahoo! 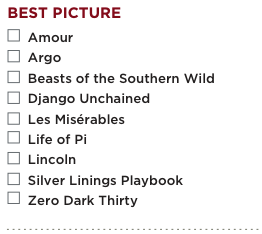 Movies ballot, which is nice and clean with minimal branding. The categories are also laid out neatly, so it'll be easy to score at the end of the night. Of course, there's more to hosting the party: inviting people, buying prizes and food, putting up decorations, and making sure you've got enough liquid refreshment on hand. All that is left as an exercise for the reader. Man I miss these parties... Have fun!